I have written many posts about beautiful doors I’ve seen in my travels…Morocco, Guatemala, Spain, Costa Rica, Mexico, and of course, many US states. I have not yet posted any door photos from Paris, because I haven’t made it to France yet (it’s on the list). Sadly, the world is mourning the fire damage to Paris’ Notre Dame Cathedral today, and it’s too soon to know what the timeline will be for rebuilding/restoring the beloved landmark. The good news is, much of the structure as well as the amazing doors of Notre Dame are reported to have survived the fire. And it turns out that the doors of Notre Dame are not just ordinary doors; there is a legend that dates back hundreds of years, to the 13th century. As the story goes, there was a young blacksmith named Biscornet, who was hired to create the decorative ironwork on the cathedral’s doors. His work was one of the final details of the cathedral. When the doors were unveiled, Parisians were amazed at the intricate detail and artistry, as this level of work had never been seen before given the limited tools available at the time. In fact, the ironwork was so impressive that a rumor began to circulate accusing Biscornet of selling his soul to the devil, as such beautiful work could not have been created by human hands. 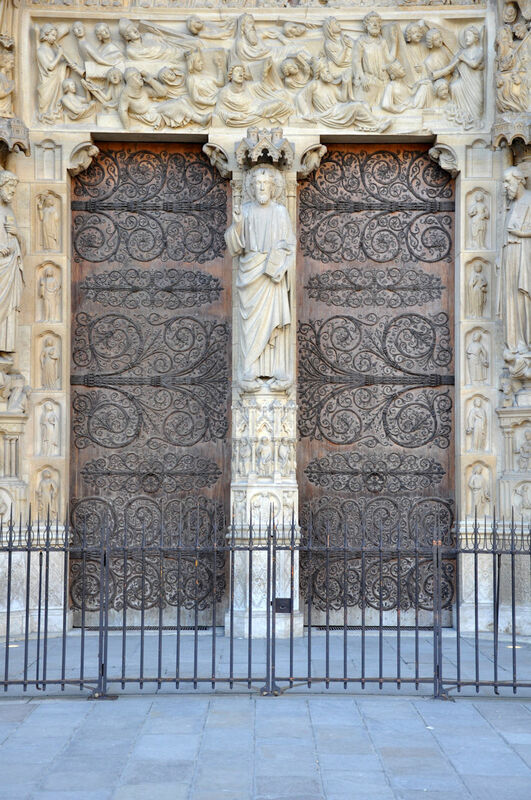 There are some beautiful photos of Notre Dame’s doors, including the ornate lock, on this blog post from A French Frye in Paris, and there is even a documentary available that details how the ironwork was created. Hopefully I’ll be able to see the doors in person someday, and ponder the legend of Biscornet and the artistry that was ahead of its time. I wonder if the medieval builders actually thought the stone vault would act as a fire door. Truly works of art . And a great sadness felt all over the world.